Are you a business and looking at holding an event? Corporate marquee hire allows businesses to create their own bespoke venues as well as marquees providing solutions to operational challenges. We have provided marquees for conferences, shop extensions, exhibitions, staff parties, annual dinners, sporting events, charity functions and temporary storage. Worried about Health and Safety? We are fully covered on site and have all the relevant Health and Safety documentation to get through any red tape. Our staff are fully trained in all areas when it comes to working on site and with the general public. All members of staff wear high visibility clothing and have the appropriate PPE to work on any sites. Having a stall at a trade show and unsure on what the weather will throw your way? We can help, with a basic marquee you are fully protected from the weather. You can have the sides of the marquee closed for protection against the elements or even no sides at all to give the feeling of the outdoors but with the protection of a roof. Our current marquee line up includes 3, 6, 9 and 12 meter spans which are easily extendable in three meter modules, meaning we can easily accommodate for differing size requirements. With linings, solid wood floors, carpets and internal fittings it is easy to see how our adaptable marquees can be tailored to your needs. 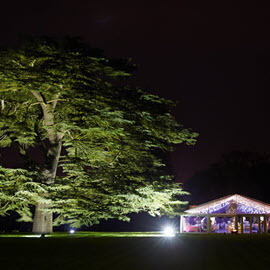 Once you have the marquee arranged you may require some finishing touches, furniture, lighting and other features to make your corporate marquee event more bespoke. 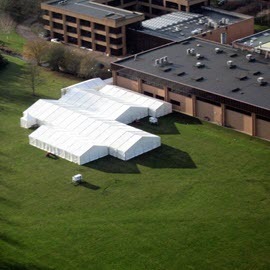 We can tailor your marquee to what you require for all types of events and trade shows.